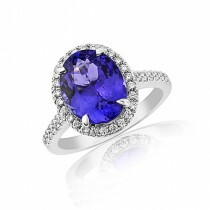 Coloured Stone Engagement Rings	There are 35 products. Diamond and coloured stone engagement rings. 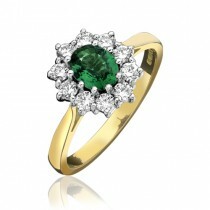 Choose from our wonderful range of gemstone rings including sapphire, emerald and ruby engagement rings. Further selection available in-store. 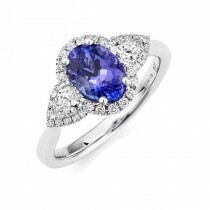 Using a small but very fine round sapphire (3.25mm), our designers have surrounded the centre and encrusted the shoulders with fine pavé set diamonds to create a dainty but very pretty dress ring that will enhance any outfit. 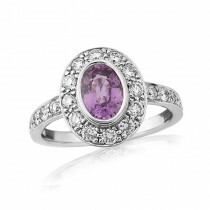 Using a small but very fine round ruby (3.25mm), our designers have surrounded the centre and encrusted the shoulders with fine pavé set diamonds to create a dainty but very pretty dress ring that will enhance any outfit. Using a small but very fine round emerald (3.25mm), our designers have surrounded the centre and encrusted the shoulders with fine pavé set diamonds to create a dainty but very pretty dress ring that will enhance any outfit. 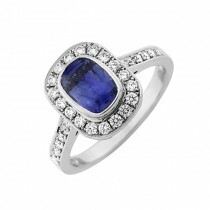 A very pretty diamond and sapphire dress ring. A 9ct white gold ring featuring an oval sapphire to the center with ornate diamond set shoulders and millgrain detail on the band. Also available in ruby. 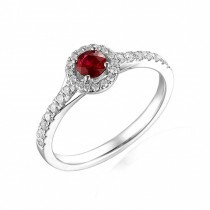 The two pear shaped diamonds flanking this deep red, 7 x 5mm oval ruby lend a standard three stone ring a slightly different look. The claws on this modern ring also curve underneath so that it can be worn next to a wedding ring or on its own as an impressive but timeless dress ring. White gold and platinum versions of this style are also available. 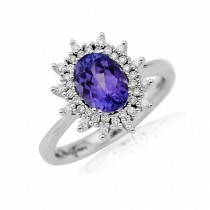 Undertones of lilacs and violets enhance the royal purple colour of the superb one carat amethyst in this attractive dress ring. Five fully cut diamonds, graduated in size, decorate each shoulder to complete the contemporary look and provide extra sparkle. 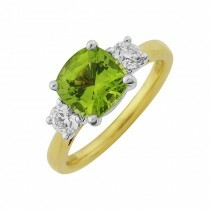 This ring is made in 18ct yellow gold but can be ordered in alternative gold colours and purities. 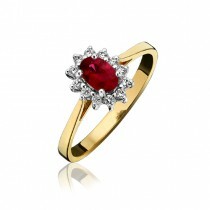 Twelve claw set diamonds surround this 6 x 4 mm oval ruby which weighs over half a carat. With its premium deep red colour contrasting beautifully against brilliant white diamonds, this ruby cluster is a perfect rendition of one of the all-time classic rings. 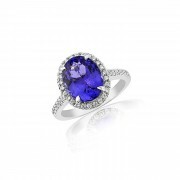 A fine quality oval tanzanite brimming with hues of lilacs, blues and purples is the centrepiece of this beautiful dress ring. Our designers have set juxtaposing pear shaped diamonds on either side and surrounded all three gems with a fine halo of round white diamonds. A modern classic in 18ct white gold. This dainty and delightful ring contains a 6 x 4mm oval emerald of excellent colour surrounded by twelve brilliant white diamonds, all claw set in 18ct white gold with a yellow gold shank. This style is available in a variety of stone sizes and metal colours.